NASA has selected five finalists for further study during the next year as a first step in choosing one or two new robotic missions for flight opportunities as early as 2020. One of the concepts selected for further study is from Arizona State University’s School of Earth and Space Exploration. The proposed mission to asteroid Psyche would reveal insights about planet-formation processes and the early days of the solar system, and would also afford the opportunity to explore, for the first time ever, a world made not of rock or ice, but of iron. Each investigation team will receive $3 million to conduct concept design studies and analyses. After a detailed review and evaluation of the concept studies, NASA will make the final selection by September 2016 for continued development leading to launch. Any selected mission will cost approximately $500 million, not including launch vehicle funding or the cost of post-launch operations. In November 2014, proposals for spaceflight investigations were requested for NASA’s Discovery Program, a series of relatively low-cost, focused science probes aimed at exploring the solar system. A panel of NASA and other scientists and engineers reviewed 27 submissions. The concept selected will become the 13th mission in the agency’s Discovery program. Lindy Elkins-Tanton, director of ASU’s School of Earth and Space Exploration, hopes 13 will be her lucky number. The target asteroid, 16 Psyche, resides in the main asteroid belt between Mars and Jupiter. Discovered in 1852, it is large (about 250 kilometers, or 155 miles, in diameter), very dense and made almost entirely of iron-nickel metal. 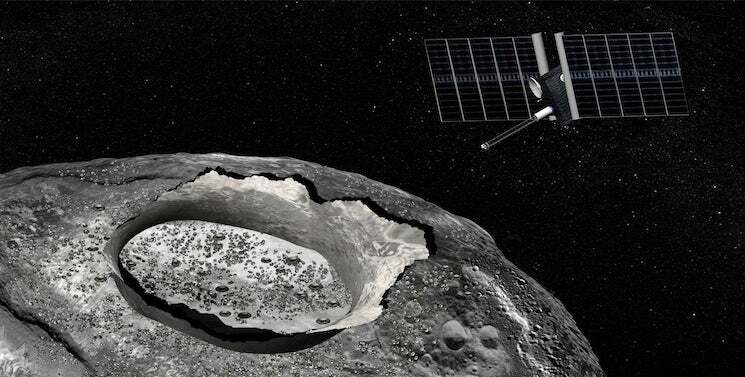 If selected, the Psyche spacecraft would orbit the huge metal asteroid for about 12 months, studying characteristics such as topography, gravity and magnetic field and surface features. The craft will be carrying a suite of instruments, including magnetometer, imager, gamma ray and neutron spectrometer. The proposal includes ASU colleagues Erik Asphaug and Jim Bell, both professors in the School of Earth and Space Exploration, and is in partnership with JPL and Space Systems Loral. For more information about the finalists, visit: www.nasa.gov/press-release/nasa-selects-investigations-for-future-key-planetary-mission.